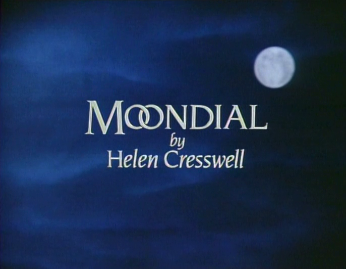 Moondial is a children's TV show which may leave you rather baffled as questions with no answers rain down on you like a summer storm, but you can rest assured that this irked puzzlement will take place from behind the sofa. 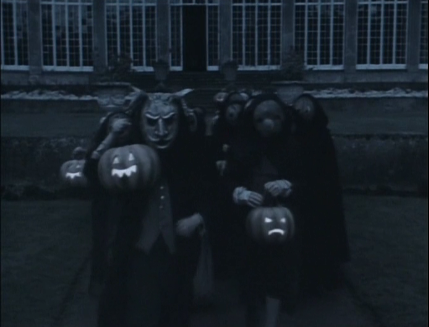 You see, from the cold opening sequence with its cacophony of haunted, otherworldly tones to the creepy Halloween finale, Moondial is real horrorshow. Founding its narrative in a good old fashioned ghost story, Moondial taps into that area of the brain which operates purely on instinct and won't rest until every square inch of your body is covered in goosebumps. Following the death of her father, Minty (Siri Neal) has been out of sorts and her mother (Joanna Dunham) decides that a change of scenery may help Minty readjust to a world without a paternal figure. Minty soon finds herself travelling to Lincolnshire to liver with her Aunt Mary (Valerie Lush), but the apparently tranquil change of surroundings is soon shattered when Minty's mother is involved in a car crash shortly after dropping Minty off. Precariously balanced between life and death in a coma, Minty's mother presents yet another stressor for Minty's fragile, pubescent state. Mocked by the local children, Minty finds temporary refuge in the beautiful grounds of Belton House and, in particular, finds herself mysteriously drawn towards a moondial in the gardens. Flanked by statues of Chronos and Eros, this moondial is much more than just a standard timepiece as it's capable of transporting Minty back in time. Minty's first travels take her back to Victorian times where she meets the TB suffering kitchen boy Tom (Tony Sands), but eventually Minty (and Tom) find themselves going back to the 18th century where they come across the troubled Sarah (Helena Avellano). 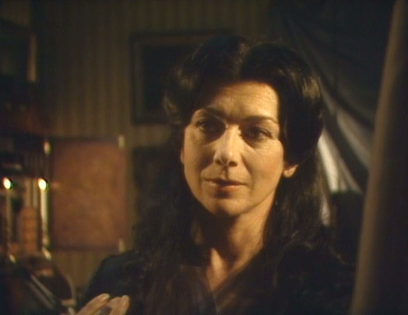 Blighted by a birthmark which her contemporaries believe is the mark of the devil, Sarah leads a lonely terrified existence where she is hidden away within Belton House under the cruel watch of Miss Vole (Jacqueline Pearce). Determined to save both Sarah and Tom from their unsettled, cheerless existences, Minty sets out to bring peace to their lives. A plan of action which is backed and urged by 'Old' World (Arthur Hewlett), a present day local who is well aware of the ghostly children trapped within Belton House. Minty documents her trials and tribulations with the past onto a tape recorder as a story that she hopes will rouse her mother from her deep coma. However, Minty's quest has an unexpected obstacle in its way in the form of darkly enigmatic ghost hunter Miss Raven (Jacqueline Pearce), who Minty soon discovers has a disturbing connection to Belton House's ghostly past. Based on the 1987 novel - of the same name - written by Helen Cresswell, Moondial was a six episode series which first aired in 1988 on Wednesday evening's at 5.05pm on BBC1; one repeat of the series came in 1990. 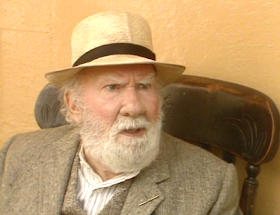 Curiously, the series has had several home releases with a 'movie edit' of the series being released on VHS in 1990 and 1995 with a DVD version coming out in 2000. The first episodic release didn't land until 2009 when it had a limited DVD release through Reader's Digest, a much more widely available DVD finally came in 2015. Helen Cresswell continued the writing duties for the TV adaptation having previously written scripts for The Bagthorpe Saga and The Secret World of Polly Flint. Keen to continue in the world of telefantasy, Cresswell also went on to script Five Children and It, The Return of the Psammead, The Demon Headmaster and The Phoenix and the Carpet. Directing Moondial was Colin Cant who had previously directed the equally spooky The Children of Green Knowe and later found himself in the director's chair for Russell T Davies' early, mysterious offerings of Dark Season and Century Falls. Moondial certainly made an impression on me as a youngster - I think I probably caught the repeat of the series - and its dark, troubling atmosphere ensured that it was indelibly stamped upon the section of my young memory reserved for dealing with things that go bump in the night. 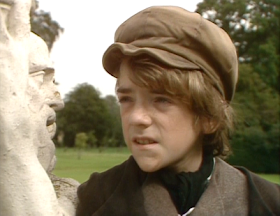 Admittedly, in the intervening years, I frequently mixed up the narrative with that of Tom's Midnight Garden, but please, people, give me a break as they aired around the same time and both featured characters called Tom. So, I retained a sense of unsettling anxiety whenever I heard mention of the show, but how would I interpret these supernatural goings-ons nearly three decades later? Well, Moondial instantly harries you into a world of unease with that pre-titles opening which is soundtracked by ominous, rumbling organs and shrieking, ghostly synths which create a terrifyingly discordant racket. As this unearthly symphony unfolds, a young girl in white sets off from a set of church gates, making her way across a moonlit lawn and towards a moondial where she pauses. A light in a grand house at the top of the lawn draws her attention and she hurries towards it. Peering into the window, she's confronted with a ghostly apparition of herself pursued by a lady in black who wrestles her away from the window. And, dear God, it's true, nightmare inducing territory. It's bewildering, it's unsettling and it terrorises the senses with a thrilling energy and ease. Thankfully, after that (and the titles) we're back in normality to catch our breaths and pray that the opening was nothing more than a traumatic misstep by the director. After all, this is children's TV, right? We don't expect to have such deep-seated fear imprinted on our soul at this age, right? Unfortunately for us, Colin Cant is quite happy to continue fashioning this imprint with a sledgehammer. The disconcerting feeling of perplexity and displacement soon seeps back into the narrative as Minty is first exposed to the horrific vision of her mother lying on a life support system and then begins her travails into the past. Belton House, of course, is central to the story and it's a fantastic setting, all tremendously British, but at the same time able to conjure up a sense of dread through its imposing stone walls and long, dark history. The moondial, which remains on site, is a nice centrepiece to the story and, again, adds a mystical edge to the proceedings, especially with its connotations of Greek mythology. Transporting Minty back in time, the moondial brings her face to face with new horrors. Poor Tom is under the cosh of his masters and clearly unwell, coughing up a gruesomely vivid mouthful of blood in one stomach churning scene. Nonetheless, despite his debilitating respiratory problems, he channels an urchin charm, underlined by his unshakeable belief that he'll defy genetics and become a lofty footman. It's Sarah, though, whose young soul is subjected to the most chilling and tortuous scenes, all backed up with not even a grain of hope or childlike naivety. Initially portrayed as nothing, but a shadowy, cloaked figure pursued by Miss Vole, Sarah's faceless form presents a subtle, thrilling mystery and also sets up a series of disturbing scenes. First, the local children, systematically beat and then burn a mannequin said to represent the 'devil child' and, finally, Sarah is confronted by a young, baying mob who refuse to accept that her birthmark is nothing less than a sign of the cloven hoofed beast. 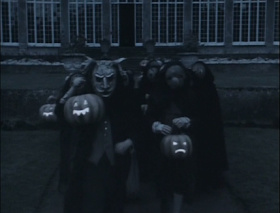 They're all wearing folk horror masks (one of which looks like an even more horrifying version of Noseybonk) and posses a bloodlust unrivalled in children's TV. Clearly, the visuals in Moondial are strong and sinister, but what of the actual story? In terms of scope, it's quite terrific as it takes in time travel and the supernatural, two genres which can be exhilarating in their own right, so the promise of greatness is set in the foundations. However, in terms of startling clarity, Moondial fares worse than a moondial on a sun-drenched afternoon. There's a basic thread woven into the narrative that Minty needs to help others be it her unconscious mother or two ghostly children. It's an admirable message and one which is translated loud and clear, but slightly more deafening are the unanswered questions left clogging your consciousness. The moondial, for example, is the central device from which all the twists and turns of the story and furiously stoked, but do we ever find out how or why it does what it does? Like hell we do! Okay, there's a brief discussion between Minty and World about 'moontime', which attempts to broach the subject but this is sadly smothered by vague notions. 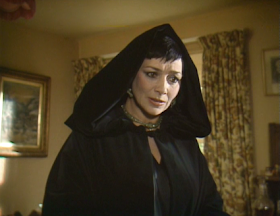 And Miss Raven's appearance in the modern day is an exciting twist, but, you know, it fizzles out to nothing. Oh, and where on Earth do Tom, Sarah and Dorry (Tom's sister) go skipping off to? Judging by Minty's discovery of Tom's grave (dated 1871), he didn't lead a long life, so did he succumb to TB and not actually glean much happiness? It's not all disappointing, of course, Tom and Minty's friendship has moments of joy, the narrative never fails to dawdle and, by the end of the serial, Minty has found redemption and is in a much clearer sense of mind than at the start. And if a hero can't come out stronger and it be considered a success then I don't know what makes a decent yarn. The acting, too, is very strong with all the young actors putting in strong, confident shifts. Jacqueline Pearce, in her dual roles, is wonderfully unhinged, particularly in her 'unveiling of the mirrors scene' which is alarming in its depiction of wickedness. Sure, Moondial may fall short in the logic stakes, but its eerie visual magnificence and gripping adventure manages to overcome its flaws and deliver a piece of children's TV which will stick with you through the decades.